3312 Pieces mixed size hot fix round crystals gems glass stones hotfix flat back rhinestones 2-6.6 mm Feature: Made of glass with multi-face cutting design, these flatback ab crystals present a beautiful, sparkling and eye-catching appearance, which can bring more inspiration and beauty to your arts and crafts. 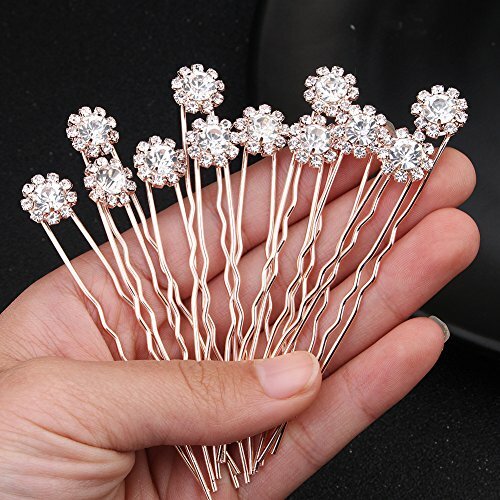 Specifications: Quantity: 3312 pieces Material: glass Diameter: 2 mm, 2.8 mm, 4 mm, 4.8 mm, 6.6mm Technology: hot-fix/ glue on Package includes: white rhinestones (Mixed size, 180 pcs); white AB rhinestones (Mixed size, 180 pcs); gold rhinestones (2.0mm, 1440 pcs; 2.8mm, 720 pcs; 4.0mm, 360 pcs; 4.8mm, 288 pcs; 6.6mm, 144 pcs). Pressing the hot parameter: Temperature: 160-180 degree/ 320-356 Fahrenheit (this temperature is suitable for cotton fabric) Times: 12-25 seconds Warm tips: Please close look at our product introduction, according to different fabrics, please try to hot, and then use for production. Small items, not suitable for children under 3 years old. 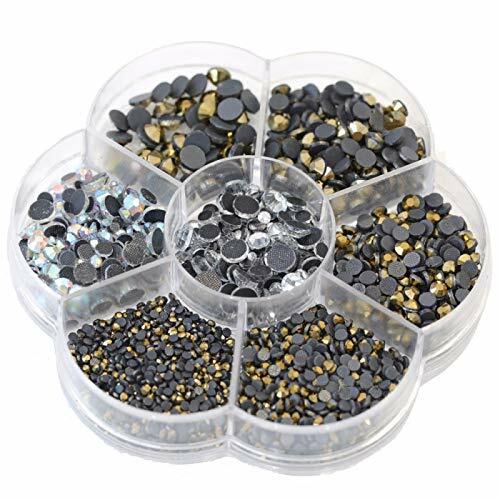 These crystal stones are hot fix glass stones, hot fix glue is already on stones, you can use a hot fix applicator to set them (hot fix applicator is not included). 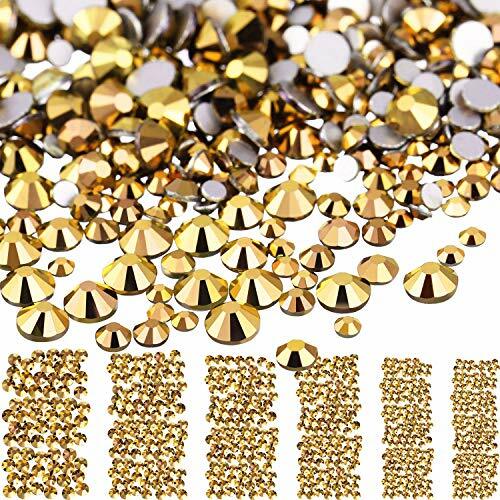 1440 Pack 4 mm hot fix round crystals gems glass stones hotfix flat back rhinestones, metallic gold Feature: Made of glass with multi-face cutting design, these metallic gold glass rhinestones present a beautiful, sparkling and eye-catching appearance, which can bring more inspiration and beauty to your arts and crafts. Easy to apply: Flatback clear crystals, hot fix glue is already on the backs, easy to stick them on handbag, greeting cards, cell phones and more with hot fix applicator or household iron, create your own sparkling items. (Hot fix applicator and household iron are not included in this package.) 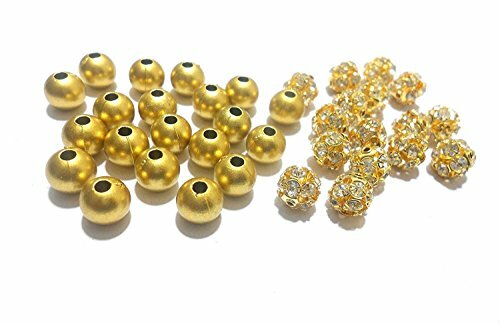 Specifications: Color: metallic gold Material: glass Diameter: 4 mm Package includes: 1 Bag of 1440 pieces flat back hot fix rhinestones Warm note: Small items, not suitable for children under 3 years old. Decorate your home or special event with these attractive gold colored acrylic ice table scatters by Royal Imports. These beautiful plastic stones are made of high quality acrylic material so they will look like real ice rocks. You can also use these to fill your favorite vase since these are completely submersible in water. They are sure to add an embellishing touch to your eye-catching centerpiece. These modern looking, flawless rocks are designed to complement and enhance even the simplest event or floral arrangement. Royal Imports brings the highest quality glassware and supplies to the floral and craft industry. Each pack of rocks is crafted to perfection thus creating a sleek, flawless accent. Uses: floral arrangements candles table scatters candy jar vase fillersPopular with: event planners florists interior designers restaurants home decoratorsNote: Choking Hazard - Keep away from children under 3 years of age.Overall Dimensions Width 3/4" Height: 3/4"
The Swarovski Xirius Rose Flatback Crystal in Crystal Golden Shadow has a light clementine and beige tone. 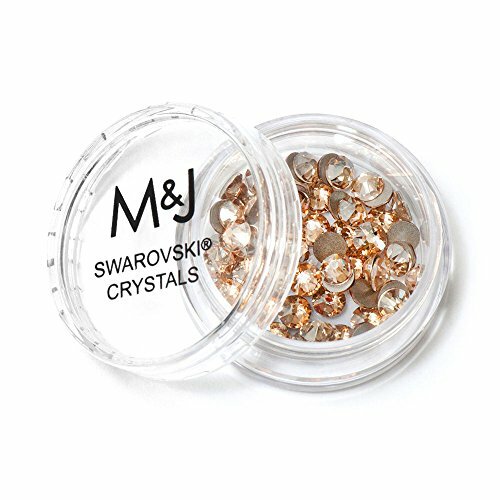 These crystals are made with a platinum foil backing to create a perfect shining finish. Cut for brilliance, each flatback crystal has an increased number of facets and a uniform design perfect for precision projects. The SS16 (4mm) size is a M&J Trimming customer favorite, and can be glued to a wide variety of fabrics, vinyl and hard surfaces. Choose this jewel-like color variant to create a dynamic background or use it in a statement stone pattern on costumes, dance uniforms, apparel, accessories and more. To apply flatback rhinestones on fabric, use a strong adhesive like Gem-Tac Glue. 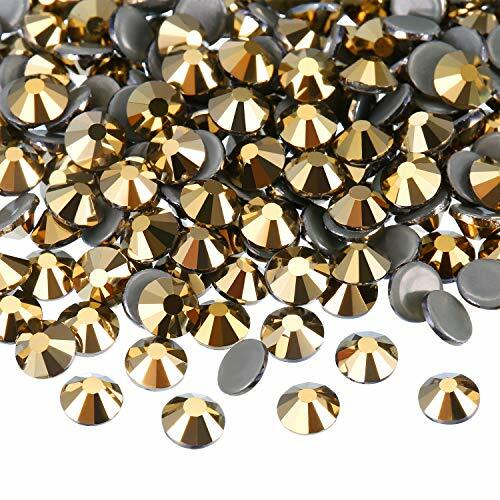 For wood, metal, glass, rubber, leather, and more, use E6000 Glue to attach flatback rhinestones. 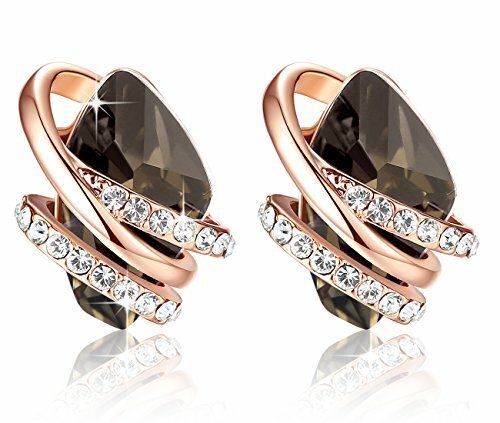 Swarovski Xirius Rose Flatback Crystal come in SS16 and SS20 sizes and a wide variety of colors including Siam, Crystal AB and Jet. Care: turn garment inside out, hand wash or choose gentle wash cycle. Use mild detergent and air dry. 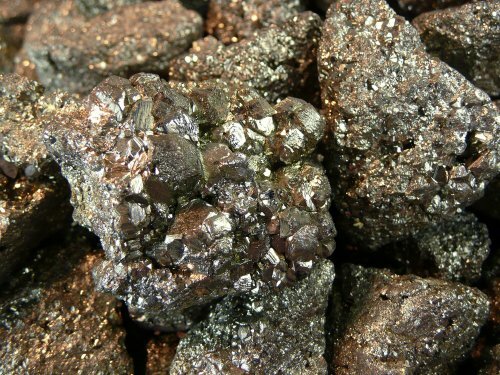 Looking for more Gold Crystal Stone similar ideas? Try to explore these searches: State Aluminum Water Bottle, 500 Texas Holdem Poker, and Smart Cycle Software Cartridge. 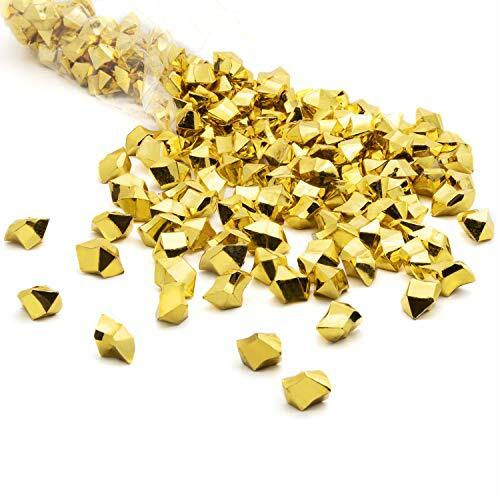 Look at latest related video about Gold Crystal Stone. Shopwizion.com is the smartest way for online shopping: compare prices of leading online shops for best deals around the web. Don't miss TOP Gold Crystal Stone deals, updated daily.